How much does it cost to travel to El Chalten? How much money will you need in El Chalten? 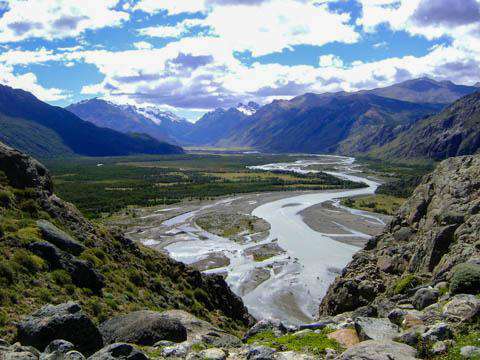 AR$1,825 ($44) is the average daily price for traveling in El Chalten. The average price of food for one day is AR$562 ($13). The average price of a hotel for a couple is AR$1,914 ($46). Additional pricing is in the table below. These average travel prices have been collected from other travelers to help you plan your own travel budget. How expensive is El Chalten? El Chalten is probably one of the most beautiful areas of Patagonia, especially at the slightest ray of sunshine and one of your cheapest destination while you are travelling in Patagonia. Indeed, you will spend your days hiking and there are no park fees. There are restaurants, souvenir shops, and outdoor stores but most of them will not accept credit cards so before heading out, get cash in El Calafate or your previous stop. For the beginners, it will be long hikes in a magical setting and for the experts perhaps a week long expedition to the greatest glaciers of the world. To discover the way people live in the pampa, you may also decide to stay at an Estancia. In the stunning Estancia Santa Thelma, about 300km away from El Chalten, you will be able to explore the surroundings by horse, live a unique experience in the middle of the nature and its vast plains occupied by thousands of merino sheep and horses and of course eat a typical meal of the region. Unlike the tourists of El Calafate, travellers who go to El Chalten are mostly hiking lovers and mountaineers, as the city is the starting point to many excursions around the Fitz Roy (3 441m) and the cerro Torre (3 138m). However you can also leave on a boat excursion on the Viedma glacier (USD$37 plus transport fee) with Patagonia Aventura. There are 1 to 2 excursions per day from October to April, departing from Bahia Tunel, about 18km away from El Chalten. While it is not as imposing as the Perito Moreno, the 30min navigation on the Viedma Lake towards the 40m tall glacier remains spectacular. Climbing is another famous activity in El Chalten. Many travel agencies offer climbing on ice excursions with experimented guides, on the Torre glacier as well as the Viedma glacier. You can also ask the agencies about their rock wall climbing excursions. El Chalten, also known as the Capital of Trekking, offers various splendid hikes departing from the Centro de Visitantes del Parque Nacional. For those who wish to start with an easy hike to admire the region, Los Condores and Las Aguilas (2h return trip) provides a panoramic view on El Chalten as well as on the Viedma Lake and the surrounding steppe. Then if you are feeling adventurous, the Loma del Pliegue Tumbado (8h return trip) is a medium level hike offering one of the most beautiful views of the region, with a spectacular panoramic point at 1490 m of altitude on the Viedma Lake, El Chalten's valley, the Grande Glaciar throwing itself in the Laguna Torre and the Fitz Roy. Other hikes depart at the north of the town, an easy 45 minutes walk to the Chorrillo del Salto waterfalls, the perfect spot to enjoy your picnic, is great for a relaxed afternoon. Otherwise, to get the best viewpoints on the Fitz Roy, the hike of medium difficulty to the Laguna Capri (3h-4h return trip) is a great option. Diverse varieties of ducks are found around the lagoon during summer. If you want to push yourself a little further, you may continue your hike towards the Laguna de Los Tres (8h-9h return trip) and you may even decide to stop for the night at the free camping site Poincenot or Río Blanco. You can also take a shuttle or your car to the Hosteria El Pilar from which you can reach the Poincenot camping more easily and quickly. You can then go up to the Laguna de Los Tres, and perhaps go back down by the original path if you wish to see a different panorama on the way back. Finally, do not mix up the hike of high difficulty to the Laguna Toro (7h to ascent, with an authorised camping site) for which you need to register at the Centro de Visitantes del Parque Nacional before leaving, with the Laguna Torre hike (6h-7h return trip), which departs from the center of El Chalten. Campamento de Agostini is a free camping site available near the Laguna Torre. For those in good physical condition, you can climb another 2km (about 1h) to reach the Mirador Maestri. El Chalten is famous for its cosy and rustic wooden eateries with seatings around a fire pit or a bar, ideal for post-trek drinks and where, during high season, you may find it hard to get a seat and could end up sharing a table with other travelers. Many restaurants offer yummy tapas and the rest of the menu is usually hearty Argentine dishes such as stews, steaks, Bife de Chorizo, trout, lamb, milanesas (a thin slice of meat covered in breadcrumbs and fried), which all need to be washed down with delicious Argentine wine. Look out for excellent value menu del dia (menu of the day) with generous portions that many restaurants offer at lunch-time. There is also a great amount of choice for vegetarians in El Chalten. Pasta, pizza, salads and other wonderful, wholesome, home-cooked foods are popular as well in the little town. To reach El Chalten you will probably need to make a first stop in El Calafate, where buses from most parts of Argentina depart and arrive but also because there is an airport. The road from El Calafate to El Chalten is spectacular. In the heart of the Andes and at the foot of the Fitz Roy, you will go through an arid steppe, populated by a few guanacos and nandous and forming a beautiful contrast with the mountains covered in snow in the background. Whether you are driving a car or travelling by bus, you will need to count about 3 hours, including a few stops to take photos of the mind-blowing views. Many bus companies have between two to three buses departing every day, usually at 8h, 13h and 18h. A one-way ticket costs about USD$15 per person. If you are coming from the airport, Las Lengas organizes two to six buses every day, depending on the number of incoming flights, from the airport to your hotel in El Chalten for USD$27. The only other city that has direct buses to El Chalten, is Bariloche. There are about three to four direct buses per week from mid-november to mid-april. It is not recommended to do a return trip in a day, as the small village has little appeal but its surroundings are splendid and you will need a few days to discover the sights and activities around El Chalten.